By late 2016, I completed what would certainly become the most important book translation I'll ever work on: "Eu sobrevivi ao Holocausto," the memoirs of Holocaust survivor Nanette Blitz Konig, who was Anne Frank's classmate after the school system in Amsterdam became segregated. 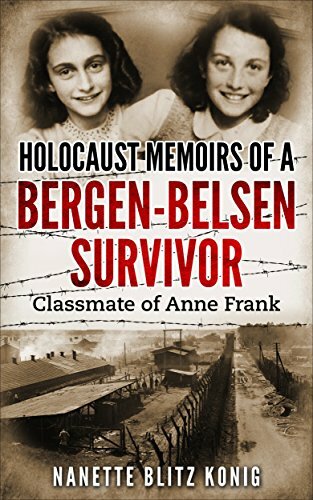 In English, the book is titled "Holocaust Memoirs of a Bergen-Belsen Survivor and Classmate of Anne Frank," which was published by Amsterdam Publishers. There is also a Dutch version published by Prometheus. I received a message in mid-2016 from a translation company in Brazil to work on a translation sample for the consideration of the author herself and her family. Nanette, who was born in Holland and moved to England after the war, married an Englishman of Hungarian descent who got a job offer in Brazil―and that is how she ended up in my home country. Once the sample was approved, the Brazilian translation company hired my services and I started working on this important historical memoir. Nanette uses accessible language and sometimes readers will be able to see that young teenager materialize before their eyes as they read her words. Perhaps her language register, of an educational tone, is due to the fact that her work now consists of talking to students about World War II and the Holocaust in order to make sure that younger generations will be aware of what happened to her when she was their age―and what could happen again if society is divided due to prejudice, xenophobia, and extremism. At the most recent American Translators Association annual conference, which took place in Washington DC in October 2017, I talked to attendees about the challenges of working on such an important piece of non-fiction literature, including the terminology accuracy required by real events that have been widely documented in the English language, as well as the difficulty in keeping an emotional detachment from the story in order to convey the author's message faithfully. My ATA session was reviewed by Melissa Sabella Harkin―fellow Brazilian translator living in the United States who is a descendant of Dutch Jews who moved to Brazil―on the Winter 2017 issue of Source, a publication of the ATA Literary Translation Division (see "Too Close to Home" on page 23). I highly recommend "Holocaust Memoirs of a Bergen-Belsen Survivor and Classmate of Anne Frank," for the lessons it teaches us about one of the most senseless moments in our contemporary history.